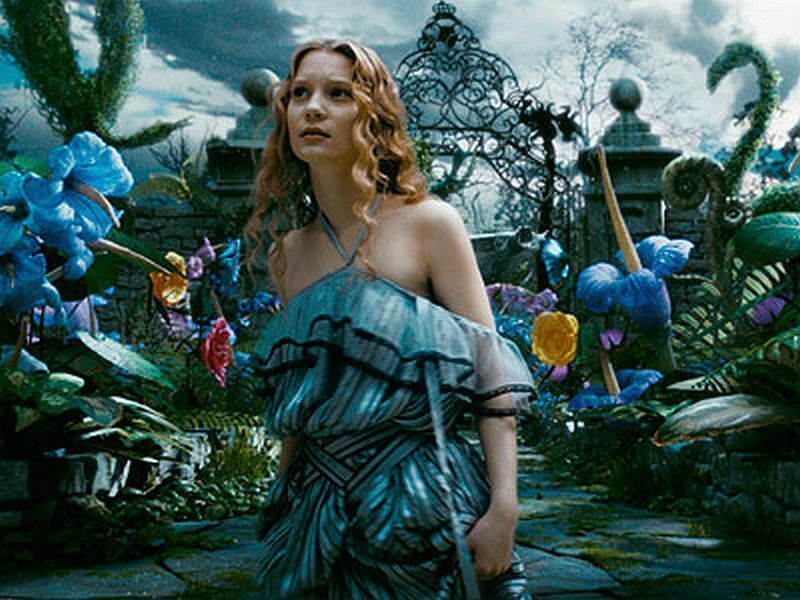 I went to see Tim Burton’s Alice in Wonderland last night. It was a surreal experience. Of course, even if it had been a classic interpretation of the story, it still would’ve been fantastical. Alice in Wonderland is, after all, one long, wild dream. But this was no gentle, Edwardian, jam tarts interpretation of Alice, but rather, a more macabre, menacing vision of Wonderland. Burton’s trademark stamp was clearly manifest – the craggy trees and mist, garish costumes and production design and familiar collision of old lace and punk rock. To add another layer of surrealism, the movie was in 3D, which judging by the posters in the cinema, is the new hot gimmick. 80% of the upcoming films advertised as we sat through the opening used the same technology, and one even advertised a new Sky 3D HD service for home television. My sister and I peered at each other through our geeky glasses, both thinking the same thing – one day we’ll be telling our kids about the days all movies were flat. I wonder how far we are from the vision of the future where virtual experience really threatens to replace real life. I know it’s a cliched thing to consider, but hey, shocking realities sometimes take a while to sink in. I’ve been reading from the Srimad Bhagavatam lately, which sometimes compare this life to a dream from which we wake up at the time of death, either to return to reality, or move to a new body, like Alice, falling down the hole into a world where things often seem so unfair, and chaos is the status quo. Once there, she forgets both her name, and the world that she came from. I had a little laugh to myself on the way home. When I was young we used to make fun of my Dad, who would invariably find something spiritual to comment on in any piece of entertainment. Squinting as we stepped out of the dark cinema, we’d roll our eyes as he wasted no time pointing out parts of the film that had any connection with reincarnation, karma, India – if you could find it in a Disney cartoon, he would. Last night as the caterpillar spoke to Alice, suspended upside down inside a rapidly forming cocoon, I knew what he was thinking. ‘Are you dying?’ said Alice. ‘No, just transforming,’ said the caterpillar, calmly closing his eyes. My dad spoke at the same time as I thought on the drive home. ‘-I know, me too,’ I interrupted.